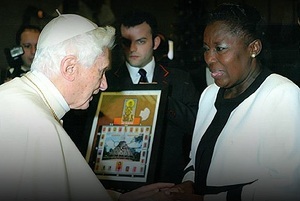 Yesterday, Kadaga was at the Vatican to meet the Pope and to attend a human rights conference. She received the blessing during a mass attended by thousands of pilgrims at the Vatican. “I think it is something that I will remember all my life. It’s a very great moment and I thank God for this opportunity,” Kadaga said minutes after meeting the Pope, Uganda’s New Vision reports. Uganda’s bill, which stipulates the death penalty for repeat gay offenders, is currently before the country’s parliament. On Monday, dozens of people gathered outside the Ugandan High Commission in central London to demonstrate against the bill. A letter of protest was handed in to the High Commission. It called on Ugandan President Yoweri Museveni, and his parliamentarians, to reject the bill and to stop persecuting LGBT people.